Before you can claim a bonus you must contact customer support first. You are not allowed to use the gamble feature on slots and video poker games. You are not allowed to wager more than 20% of the bonus. The moment your bonus balance is lower than 10 credits the maximum bet will not be lowered. This is how it works: If you have $100 in your bonus balance you cannot wager more than $20 per bet. After you accepted the deposit bonus you have 15 days to clear the wagering requirements. GoWild Casino offers first time customers 30 free spins. The maximum amount that can be cashed out from the free spins is 100 credits. A withdrawal is only allowed once you've staked your winnings 35 times. Players from the following countries qualify for the free spins offer: Australia, Austria, Canada, Czech Republic, Finland, Germany, Greece, Greenland, Iceland, Ireland, Japan, Liechtenstein, Luxembourg, Netherlands, New Zealand, Norway, Portugal, Russia, Slovenia, Sweden, Switzerland, Turkey and United Kingdom. GoWild Casino is licensed by the Lotteries and Gaming Authority (LGA) of Malta in accordance with Maltese and European Law. Malta is a UK white listed jurisdiction and ideal for players from Australia, Canada, Europe and the United Kingdom. Gambling licensee-Class1 remote gaming license. Gambling License Number-LGA/CL1/474/2008. 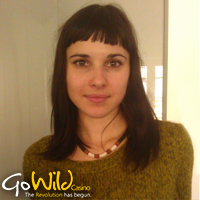 The slogan that greets first time players when they visit GoWild Casino is “The Revolution Has Begun”, which revolution I am not sure. GoWild is powered by Microgaming software. It offers a medley of 500 games that includes 120 video slots, table games, keno, parlor games, huge progressive jackpots and a live casino. The software is available in the ”Download” or “Instant Play”. The latter version can be played in your browser and suitable to Mac users. Just make sure that the latest Adobe Flash Player plugin is installed onto your PC. New players receive a welcome bonus package up to $€1,000 plus free spins on selected slot games. To qualify for the bonus a deposit of $€20 is all that’s needed. The wagering requirements attached to this bonus is 40 times. The following games contribute 100% towards the completion of the wagering requirements: All slots (progressive games excluded), Fruit Machines, keno and scratch card games. If you do not want the bonus offer you must contact a live operator first before placing a bet. Apart from the ordinary welcome bonus package a VIP program enables players to earn comp points which can be exchanged for cash. One of the highlights of GoWild is its Fast Cash program, it aims to process all withdrawals within 6 to 24 hours once you’ve verified your identification. An additional feature we like is the $10,000 per week withdrawal limit which is ideal for high rollers. In the best interest of fair gaming GoWild also encourages responsible gambling. Before you register an account you must provide the necessary documents indicating that you are older than 18 years. If you feel that you need a ”cooling” off period you can self-exclude yourself from the site for a certain period to indefinite. You can also set your betting and session limits. Customer support can be contacted via live chat, email or telephone. It can happen that the live support staff won’t be able to answer all your questions, in turn the casino will refer you to a manager via e-mail. GoWild is ideal for novice and seasoned players it strives to process all withdrawals within 24 hours, in our books this notion deserves a thumbs up. In summary. There’s a lot to like about GoWild. The casino endeavours to process all withdrawals as quickly as possible, it offers free spins on selected slots, a huge deposit bonus, 7-figure progressive jackpots and not to mention the stupendous amount of games. The only downside is the limit on weekly withdrawals of non-progressive winnings. Otherwise highly recommended. Welcome Bonus: up to €$1,000 free spread over three consecutive deposits. To qualify for this bonus offer a deposit of $20 must be made. First Deposit: 100% Bonus up to €$200 plus 50 free spins to wager on Thunderstruck II. Second Deposit Bonus: 50% Bonus up to $400 plus 50 free spins to wager on Lara Croft: Tomb Raider Secret of the Sword. Third Deposit Bonus: On your third deposit you will receive a bonus of 70% plus 50 free spins to wager on the classic slot game Avalon. Once you have made and wagered your third deposit you will be invited to participate in a $350 Exclusive Freeroll on Thunderstruck II which takes place on the 27th of each month. Weekly Free Spins: Players who have completed the welcome bonus offer will be invited to participate in the casino’s weekly promotional offers. You will be updated via the casino’s newsletter concerning its latest promotions and new game releases. VISA, MasterCard, WebMoney, Maestro, Neteller, Click2Pay, Ukash, Skrill (MoneyBookers), Eco Card, UseMyBank, Instadebit, Paysafecard, iDeal, Poli, Wire Transfer, Entropay, Click and Buy. Deposits can be made in US Dollars, British Pounds, Euros, Australian and Canadian Dollars. Withdrawal requests via web wallets will be processed within 24 hours. If you request a withdrawal via credit or debit cards it normally takes 2 to 5 business days before it is cleared. The minimum amount that can be withdrawn is $100. The maximum withdrawal amount per transaction at the casino is £120,000 and £100,000 at the poker network. Please note that progressive jackpot winnings are excluded from this amount. GoWild Casino offers 500+ casino games that are regularly updated and new games are released every month. Table Games: Various Blackjack and Roulette variants offered as well as Baccarat, Casino War, Craps, Keno, Pontoon, 3 Card Rummy, and many more. Video Poker: Play as little as 1 Hand to 100 Hands such as Aces and Eights, Deuces Wild, Aces with Faces, Joker Poker, Jackpot Deuces and so on.